I’ve often written negatively about many biopics over how they tend to follow a basic chronological template with little frill or surprise. Get on Up, Tate Taylor’s new movie about the life and career of James Brown, doesn’t do this, and jumps around extensively, showing a moment that could range anywhere from 1939 to 1993. There are a few other interesting approaches explored, such as breaking the fourth wall (Brown addresses the camera specifically) or placing characters or components from a certain time period in another scene, which helps bring many connections from the beginning and end of the film together. These components and others help form an entertaining and informative, if flawed, final product. Brown’s early life is briefly addressed. His mother (Viola Davis) left the family relatively early, leaving him in the small shack that serves as home with his father (Lennie James). Soon, he abandons his son as well, leaving him in the care of Brown’s Aunt Honey (Octavia Spencer). Several years later, he is arrested for stealing a three-piece suit and if formally convicted, could receive a multi-year prison sentence. Along the way, a gospel singing group performs at the jail. One of its members, Bobby Byrd (Nelsan Ellis), is impressed when he hears James sing. When Brown goes on parole, he forms a band with Bobby (The Famous Flames), which will serve as the starting point of his career. Get on Up’s strongest factor is its acting. 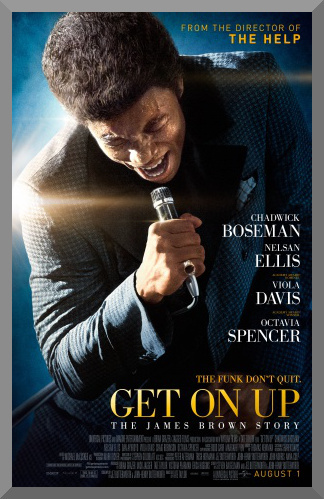 Well, it would be more accurate to specify that statement: Get on Up’s strongest factor is Chadwick Boseman. He must have studied countless aspects of Brown meticulously. He brings emotion and life to the table in the scenes off stage, but the greatest things happen elsewhere – when Boseman is in full form onstage in character, there’s never a moment when the viewer isn’t nearly fully convinced that this is James Brown. The presence and the dancing are spot-on. (This may be somewhat influenced by the fact that Brown’s actual records are used during all singing sequences and everything is lip-synched, but this doesn’t detract from the credibility of the performance in any sense). The supporting cast is uniformly commendable as well, from Ellis’ layered performance as Bobby Byrd, to Dan Aykroyd as Brown’s manager Ben Bart, or to Davis or Spencer, who are equally strong in their limited but vital roles. Jez and John-Henry Butterworth’s script, while mostly sound with the previously mentioned storytelling techniques, does suffer from a few problems. The first one is the pacing – at a total of 138 minutes, material towards the end of the second and beginning and the third acts feels occasionally long, throwing off a good amount of the momentum that the movie can build, despite the nonlinear plot. Another issue is more specific: Get on Up is a movie that feels conflicted in intent. Does it want to be a puff piece or a more honest telling that isn’t afraid to address the man’s demons? The answer remains unclear – the movie glosses over domestic abuse, drug problems, and the way he treated his band, but seems to jolt back up relatively quickly. The best entries in this genre find a smooth balance between the positive and negative, but Get on Up seems a bit confused sometimes in that respect. It almost feels like the first draft was far more clear-headed, but had parts of it hacked and slashed in the endless barrage of rewrites that by all accounts inevitably affect most big studio screenplays. Like most movies of this kind, Get on Up is forced to shorten or ignore many of the events in its subject’s life in the interest of coming in at a reasonable run time, but if a measure of success is if it is still able to present itself as a mostly satisfying account to the average viewer, I feel it works. While there’s no question in my mind that this would be a significantly less enjoyable affair without Boseman, there’s still enough good here from the writing and direction to hold up the other ends of the production, and it’s able to overcome various shortcomings to create a solidly recommendable film about a legendary man.